I can't believe there isn't one yet, but I've looked everywhere and can't find one, so, here it is! To start off with, here's some basic questions. Who is your favorite Digimon character? What was your favorite season? If you could pick a digimon partner, who would it be? Personally, the answer would be Tai, Adventure 01, and I've just decided on Gaomon. Oh, I remember watching digimon before! I loved it! You totes should, the episodes are online, personally, I love it more than anything =) The ones with tai and Kari were adventure 01 & 02, Umm.. Purple and white, Gatomon? 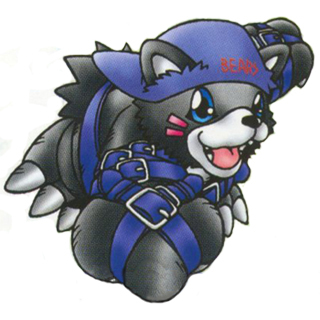 digimon was a great one... and I remember the digimon just not the name... the thing with the red emblem on his head? Calumon, that's it! Thank you very much, Mirby! I just could not remember his name. My favorite character from all the series I've seen is still Takuya from the fourth series, which ties with the third series for my personal favorite as well. 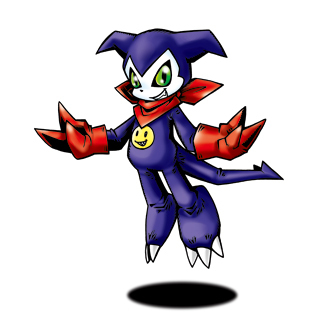 Oh, and this is probably because of Digimon World 3, but I always found this guy to be the best Digimon partner to ever, ever have. The thing about my Digimon, Tummorphomon, is that his stomach isn't stable. With it he can create items to use at will, and use his move Reality Ray to make those items real. I mean, there are limitations of course (he can't create anything larger than this stomach), but it's a good move. Lost the pics I made of him long ago though. ... So.. He uses his stomach to create items.. I hate to ask this but where do the items come out? Digimon Tamers was the best season for me. I remember watching Season 1 and 2 with my dad as a kid. Good times. The stomach itself. It's gelatinous and can shape itself to resemble items, which are then brought into being via the Reality Ray.